My name is Adam Smith and I am originally from Pittsburgh Pennsylvania. 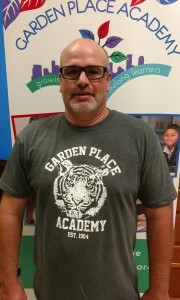 I currently teach Physical Education and assist with the technology at Garden Place Academy. I received my bachelor’s degree in Health and Physical Education with a minor in Athletic Training from Slippery Rock University located in Pennsylvania. I received my master’s degree in Information and Learning Technology from the University of Colorado. I have taught at Garden Place Academy for over 20 years and continue to enjoy working with the students, staff, and community. When I am not working I enjoy spending time with my family. My hobbies include anything outdoors. I enjoy skiing, hiking, mountain biking, camping, fishing and hunting.